Big sporting weekend coming up with the first stage of the Tour de France rolling out on Saturday, and the FIFA World Cup quarterfinal matches today and tomorrow. I can’t believe how much futball Robert and I have watched in the last couple of weeks, and more to come! Meanwhile, today English CZT Chrissie Frampton share her Quircles tangle for us to explore. Quircles is Chrissie’s sixth tangle in our collection to date. I have called it Quircles because it is formed from quarter circles. There are so many possibilities with this tangle and many variations. A few of which are below. I got so carried away with drawing all the variations that I can’t even remember where my inspiration came from but it would of been from somewhere we visited. Now that is crazy as I normally write it down in a journal. For my example of Quircles I simply added some graphite (a little darker than I intended) to the basic Quircles form but as you’ll see in Chrissie’s steps there are many ways to change up the look of her fun and easy grid-based tangle. Chrissie illustrates the step-by-step instructions for drawing Quircles below where she includes some interesting variations to explore. 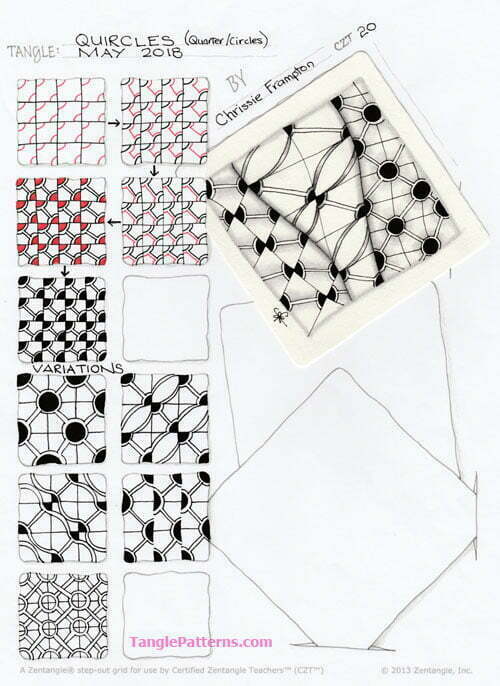 In her cool monotangle Zentangle® tile she demonstrates how Quircles looks on a wonky grid, always a fun exploration. Chrissie has also posted her steps here in her flickr album. Check out the tag chrissief for more of Chrissie’s tangles on TanglePatterns.com. So creative !! Sometimes the simplest tangles are the most effective when taken one step further “out of the box” !! ?? Such a fun pattern! Thanks for sharing! Fun fragment, Chrissie. I tried it on a couple different grids (rectangle, diamond, hex). Looks different (and great) on all of them. To Linda Farmer – I noticed that Chrissie called this tangle “Squircles” where you dropped the S and called it “Quircles”. Intentional or oops? A correction Chrissie asked me to make and I missed it, but fixed now. Thanks! Quircles is correct, as on her steps. Thanks Linda for including Quircles – I am now looking forward to seeing what people come up with. I like grid patterns so I know I will enjoy this with its variations! Really like this Chrissie and your sample tile is fabulous. Lots of fun variations. Congratulations!